While style is largely subjective, everyone can agree that a comfortable outfit can make or break your day. Especially when it comes to physical activity. 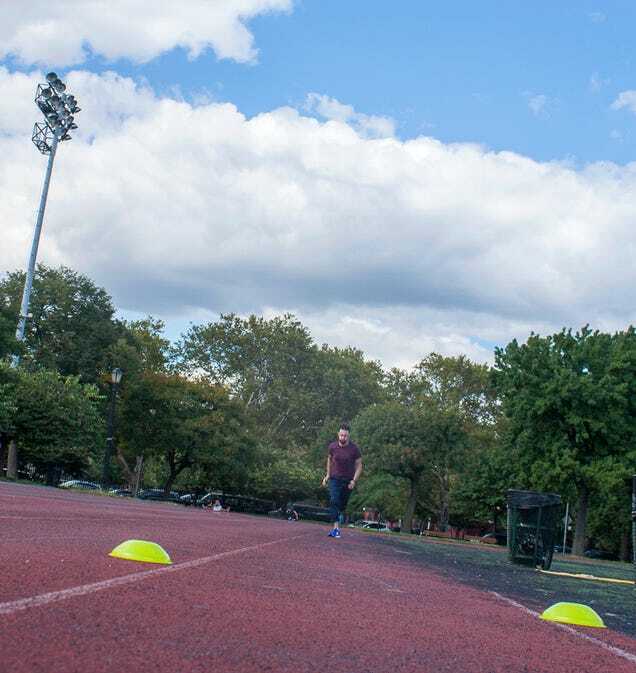 Just in time for football season, we took this a step further and challenged one of our team members, Art Director Justin, to complete a five-part sports performance combine twice: first wearing skinny jeans and again wearing J.Crew 1040 Athletic chinos. One of J.Crew’s four chino fits, these new pants are made for the guy who wants a little extra room in the thigh. Every single drill was done three times for each pant fit. Then we would either calculate the averages for comparison, or select the best times or distances and compare those. We used these numbers to find the winner. Which pair proved to be easier to wear? Find out below. To kick off our face-off, we started with the 5-10-5 short shuttle run — an agility, change of direction and speed challenge. This classic football drill consists of timing the athlete while he completes the following: 5 yards laterally, then 10 yards back in the opposite direction, and finally, 5 yards back to where he started. In the skinny jeans, Justin clocked in at 5.93 seconds on average. He couldn’t shift his body weight as quickly, nor did the jeans allow for a wide range of motion. In the chinos, on the other hand, turning and lowering his legs was a breeze. Winner winner! 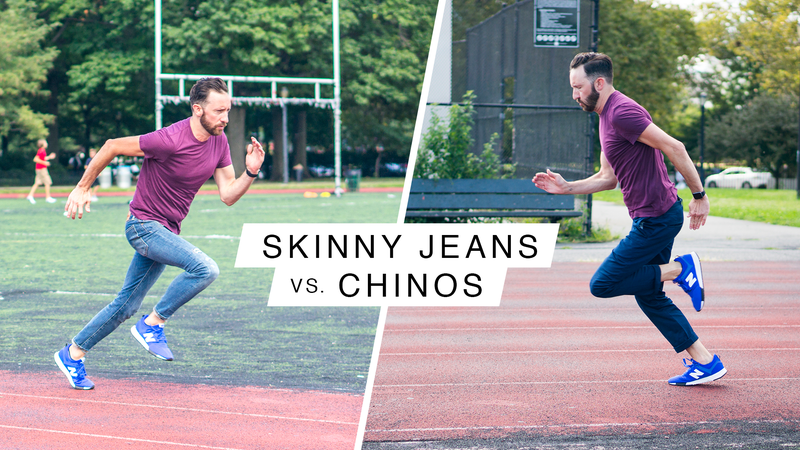 With a 5.39 seconds average, the chinos outperformed the skinny jeans. Scouts and coaches use the vertical jump to test a player’s ability to burst off the line of scrimmage using lower body strength. It’s especially useful for linemen. In our case, this challenge tested the give of the pants’ legs, so we could figure out how the two fits affected Justin’s lower body burst. Before the jumps, we complied with the standard football reach measurement of Justin’s arm (literally measuring where his arm reaches when he stands straight and raises his arm against a wall). Once we had that mark, we could measure where his hand would be in comparison when he jumped.tIn the skinny jeans, it was difficult to crouch down before each jump, resulting in less muscle power and jump height. Unsurprisingly, the skinny jeans gave us a paltry 17.25 inches in jump height. The chinos allowed Justin to bend his knees more, so he could get lower before the jump, and thus jump higher. 23.75 inches, to be exact. Hands down, the chinos won this one. This test can make or break an athlete’s career. Speed and acceleration are key. The skinny jeans were tight, and caused Justin’s legs to struggle against the material. His best time in skinny jeans was 5.74 seconds. The chinos were softer, though. He was more flexible and could move more freely, resulting in longer strides and a better time: a solid 5.23 seconds. The broad jump is challenging since you must start upright, with no forward momentum. You also have to nail your landing: no wobbling or stumbling allowed. The skinny jeans constricted Justin’s movements and limited the burst he could get from his lower body. His best jump in skinny jeans was 7 ft 5”. With the chinos, he had enough room to maintain his initial starting position balance. After the jump, he also had enough stability to avoid the staggering of his feet. Verdict: The chinos outperformed the jeans with an average jump of 8 ft 1”. For this football favorite, we arranged three cones in an L-shape (5 and 10 yards apart, respectively) and timed Justin as he ran in-between and around the cones. Imagine trying to quickly change direction and run around a cone in skinny jeans… yeah, literally not much wiggle room. Once again, the chinos vastly outperformed the skinny jeans, allowing Justin to complete the drill in just 8.43 seconds. The skinny jeans slowed him down to 9.52 seconds. Moral of the challenge: Speed and agility need breathing room. To find the right comfort fit for you, check out J.Crew’s four chino fits, including the new 1040 Athletic and the 1450 Relaxed fit chinos. This post is a sponsored collaboration between J.Crew and Studio@Gizmodo.